We are so fortunate to have such great patients in our practice. Many of our patients give selflessly of their time and money to our community. One of those patients is Kim Gresh. Kim is a long time Marietta resident who was recently named the 2012 Cobb Citizen of the Year by the Cobb Chamber of Commerce. Kim is one of those people who gives, gives, gives and asks for nothing in return. She is probably the busiest person I know, running SA White Oil Company and still finding the time to lend her time and philanthropy to countless causes. In addition to overseeing the daily operations of SA White (and Mobilized Fuels, which delivers and fuels commercial truck fleets), Kim finds the time to do great things in Marietta and Cobb County. She serves on the Board of Trustees for the WellStar Foundation; is a member of the Marietta Metro Rotary Club; a MUST ministries Board member; is vice-chair of Friends of the Strand (and has been in starring roles in two of their productions, including last month’s Steel Magnolias); serves on the Chattahoochee Technical College board; was co-chair of the 175th celebration of the City of Marietta in 2008. And the list goes on the first to volunteer and the last to leave, when her time it needed. 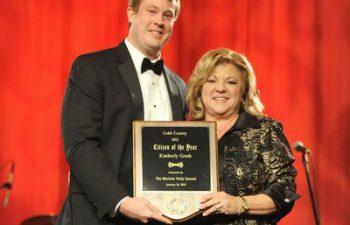 On behalf of our team here at Gilreath Family Dentistry, I congratulate my good friend Kim Gresh on being named 2012 Cobb Citizen of the Year!